In conjunction with the Australian Government’s Department of the Environment & Energy (DEE), IPWEA developed a consistent, strategic roadmap for the SLSC Programme in 2016. The Roadmap shows how a wholesale renewal of road lighting infrastructure is a once in a generation opportunity to leverage benefits that apply across several government policy and industry objectives. Its key inputs were several recent domestic and international reference documents, surveys undertaken of distribution network supply providers (DNSPs), street light and smart control technology suppliers and relevant state and territory road, energy and environmental agency personnel. The work aligns with Australian Government policy objectives relevant to street lighting - specifically increased energy efficiency, less injuries and fatalities from increased traffic and pedestrian safety and security; improved infrastructure management with improved control and enhanced liveability. Importantly the work has considered current regulatory arrangements and responsibilities for street lighting that are a fundamental a barrier to more rapid uptake of the new technologies. It examined the roles and responsibilities of local, state and federal government bodies and relevant regulations; the National Energy Market, lighting design standards, luminaire safety standards, key stakeholders in service provision and differences between the states and territories. It then identified the changes needed to facilitate the accelerated replacement of legacy street lights. 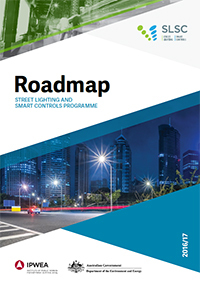 The Roadmap summarises legacy and current street lighting technology, as well as the likely technology development path. Based on survey information, estimates were made of Australia’s current street lighting assets (by type) and costs. At the time the Roadmap was written, it was estimated that Australia had about 245,000 LED luminaires installed, which represented about 10% of the total number of street and road lights. There were then only 2,200 smart controls on street light points undergoing trials or as pilots (less than 0.1%). Both were much lower than the rates in comparable overseas jurisdictions. In the years since LED installation rates have continue to climb but smart controls adoption has remained slow. The financial and other benefits of modern street lighting technologies for governments, lighting owners, lighting customers and the public have been quantified, where possible, and other benefits identified. Finally, the work presents a short and long-term vision for Australian street lighting. At a high level it indicates what implementing the Roadmap would deliver - the savings in costs, energy and greenhouse gas emissions; improved road safety, improved public security and in helping to deliver the smart cities of the future through leadership in innovation with LEDs and smart controls – and how each of the benefits relate to key government policy and industry objectives. The investment required to achieve the wholesale renewal of street lighting infrastructure has been estimated, taking into account all relevant costs, such as initial capital costs, installation costs, project management, training and education. As well, the investment required for lighting controls and other infrastructure were estimated after consulting with major international companies that provide street lighting services about the costs of current large-scale street lighting deployments overseas and how those costs might translate to Australia. Furthermore, it considers how to best optimise investment to minimise the total costs to customers. The barriers to successful adoption of modern street lighting have been identified and summarised, and solutions proposed to be undertaken through the SLSC Programme or otherwise. Wherever possible, reference was made to local and international success stories to substantiate the proposed approaches. The work involved extensive stakeholder consultation with a wide cross section of relevant private and public sector organisations. The key risks for the public and private sectors in pursuing the proposed strategies were identified and strategies to mitigate these risks recommended. The Commonwealth Government conducted Capital City policy consultation workshops in 2017 using the Roadmap as the base discussion document to identify inhibitors and consider possible policy reform. A summary of the key findings was considered during 2018 by COAG.